Earlier this year, New York Pass launched an exciting new partnership with Big Bus New York. The New York Pass is a “smart card” that offers free admission to more than 90 attractions across the five boroughs as well as special discounts to others. These include walking tours, museums, parks, gardens, boat rides, bike rentals and more. Now, New York Pass purchasers have another option: They can take advantage of Big Bus New York tours to see the city on hop-on, hop-off double-decker buses and use them to get from place to place. In the past, the bus tickets had to be purchased separately from the passes at an additional cost. 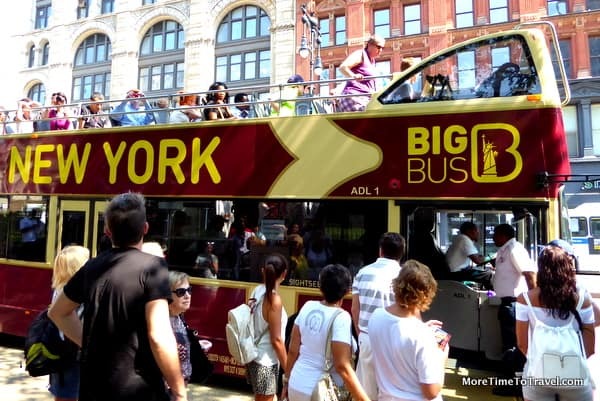 A one-day New York Pass includes a free, all-day tour on Big Bus New York. Multi-day passes come with a two-day bus tour. The buses make over 30 stops throughout Manhattan at major attractions such as the Empire State Building and Metropolitan Museum of Art, departing from each stop about every 15 minutes. With so much to see and do, the biggest challenge is figuring out how much you can pack into your schedule. After all, if you are in the Big Apple, you also have to leave time for meals—whether it’s a slice of New York pizza, an everything bagel or a deli sandwich on the Lower East Side. On our last jaunt to Manhattan, we started off the day by visiting Top of The Rock, which offers unparalleled views of the city, and then took a fascinating guided tour of Rockefeller Center to learn about its architectural and art treasures. Having been on our feet for several hours, it was great to take a leisurely, guided bus ride on the Red Downtown Loop learning some factoids that were new, even to native New Yorkers. From our overhead perch on the top level of the bus, we got to view some of the great city sights: Broadway, Times Square, Bryant Park, Fifth Avenue, the Empire State Building, the Chrysler Building, the Flatiron District, Union Square, Washington Square and more. We hopped off the bus near City Hall from where it was only a short walk to the National September 11 Memorial & Museum, certainly the most meaningful and moving part of a great day. Read the fine print on respective websites before you buy a pass to find out what’s covered and what’s not. Figure out how much time you’ll have for sightseeing, which free entries and discounts you want to use, and whether or not the pass will actually save you money. Although many passes allow you to move to the front of the line through a Fast Track line, there may still be lengthy wait times—(although, admittedly, it’s fun to meet and speak to people from other countries while waiting). Try to choose days when lines are shorter (e.g. not during heavy vacation periods). Because these iconic attractions attract so many visitors, you may be disappointed and not get into every attraction you want. If that happens, move on to your next choice. There are so many options. Passes often come with complimentary smartphone apps or booklets that offer practical tips and itineraries for your visit. Take advantage of them. For example, the New York Pass includes a free 200-page guidebook with detailed maps, hours of operation, tips and directions to every featured attraction; the guidebook is also available for download in the Apple or Android store. Get a good night’s rest the night before your outing, and wear comfortable walking shoes and layered clothing. Bring suntan lotion if you are sitting on the top of the bus. For more information and a complete list of attractions where the pass can be used and pricing, visit www.newyorkpass.com. New York Pass encouraged our trip to NYC by providing us with complimentary one-day passes but any opinions expressed in this post are our own.